What do the locksmith’s daughter, the gravedigger’s son and a fortune teller have in common? Tessa Skye is the sixteen-year-old daughter of the town locksmith and she misses her mother terribly. Having not seen her mom in twelve years, Tessa’s only reminder of her is a strange magical artifact in the form of a sparrow necklace. This artifact allows her to transform into a sparrow and fly over Sorrenwood, all the while leaving her troubles far below her for a little while. On one such occasion, she finds herself at the castle compound of Lord Fellstone, the cruel ruler of her area. Now as a target, Tessa finds that he will stop at nothing to get back what is his. After Fellstone’s guards murder her father, Tessa sets out to the castle with Calder, a fortune teller and Ash the gravedigger’s son to steal another of Fellstone’s magical items that is said to restore life. The three however, have more in common than they know as they discover that their individual reasons for undertaking this mission are intertwined. I had initially nominated this book for publication via the Kindle Scout program, and while I was sad to see the nomination not selected I was pleased when the author contacted me because what I had seen of the book in the scout program piqued my interest. This is the first novel for author Marjory Kaptanoglu, but she is not new to the writing profession. As I reviewed her IMDB page I discovered that she is a screenwriter by trade. Kaptanoglu has taken her years of writing experiences and has used them well in the creation of Tessa’s tale. If I had to assign a sort of genre label to Dreadmarrow Thief, I think it can best described as a “young adult quest fantasy”. Having ready many D&D themed stories in my younger days I am familiar with this sort of formula, but that does not mean at all that the story is formulaic. Tessa, Calder and Ash form an easy friendship based on not only necessity, but also a common goal. Together they undertake an adventure of revenge, rescue and resurrection and end up learning more about themselves and the world they live in. While there is closure to the overall story, Kaptanoglu has left the door open for future tales and more adventures in Sorrenwood. This fantasy is perfect for anyone who loves stories set with a medieval setting, old D&D adventures, sorcerers, magic, family and love. 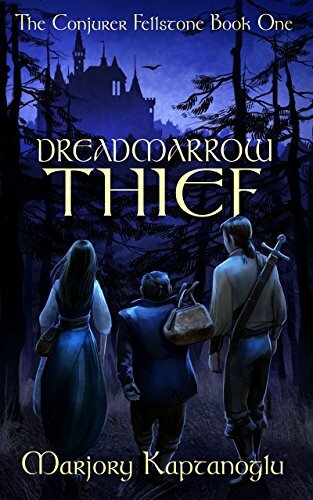 After having read the Dreadmarrow Thief for myself I have also placed it on my son’s “to be read list” as I am confident that he will love it as much as I did.